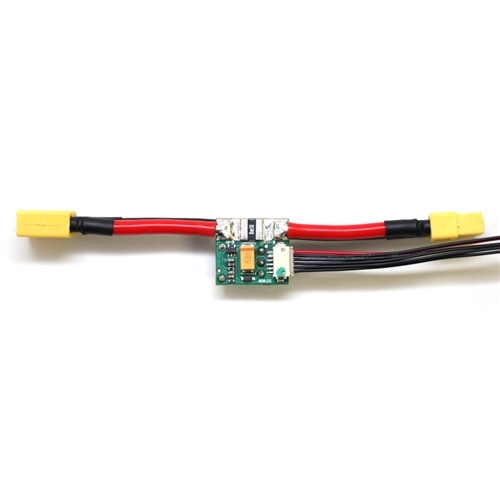 The APM Power Module is a simple way of providing your APM 2.8 with clean power from a LiPo battery as well as current consumption and battery voltage measurements, all through a 6-pos cable. The on-board switching regulator outputs 5.3V and a maximum of 2.25A from up to a 4S LiPo battery. The Power Module comes completely assembled with XT-60 connectors, and wrapped in shrink tubing for protection. Note: The Power Module is only designed to power APM, a RC receiver and APM accessories (GPS, 3DR radio). It is not designed to power servos. Use your aircraft's own ESC/BEC for that.